The land where Carolynne’s Cottages now stands was cleared and claimed in the early 1900’s by Henry Young, Carol’s paternal grandfather. On the crest of the hill where the pond is now located was an aboriginal camp with whom Henry communicated and learnt many of their ways. 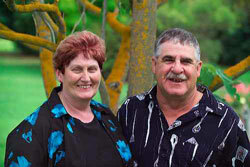 After an around Australia holiday in 2000, Carol and Daryl looked to set up a retirement fund for their future and so Carolynne’s Cottages was established in Naracoorte, Limestone Coast. After many months of research, plans drawn and then redrawn several times over, construction began late in 2001. These cottages were unique in design, furnishings and exteriors to compliment the already established beautiful country gardens to encourage visitors to experience their ultimate luxury, comfort and complete privacy. The cottages opened for business in July 2002 and have brought many happy memories and will continue to do so as families choose Carolynne’s Cottages as their ultimate holiday destination. Robyn Dempster, the Manager for Carolynne's Cottages is hoping you will choose Carolynne's Cottages for your next weekend away.